Similar to a ‘book club’, consider starting a ‘personal branding club’ where a group of professionals meet to flesh out perceptions and talk careers. It is a logical extension from what Dorrie Clark suggests in her book Reinventing You. [i] Her idea is to create a focus group to understand what close associates think of you – your personality, style, core-competencies, career path, and relationships – collectively what can be thought of as your personal brand. All I am suggesting is to give each group member their own special night and commit to a schedule like any other club. The group consists of associates who know enough about each other to share personal and professional insights. I suggest creating a Google + group for coordinating the events of the group (make sure to include a Google calendar). Plan an event, say one Thursday a month, so each member becomes the focal point. (The frequency of the meetings depends on the number of people in the group.) When it is your night to be the target of the group, you host the event and, as Ms. Clark says, you provide a comfortable environment with refreshments – show appreciation that people are willing to spend their time on your behalf. This is not much different from how book clubs operate. 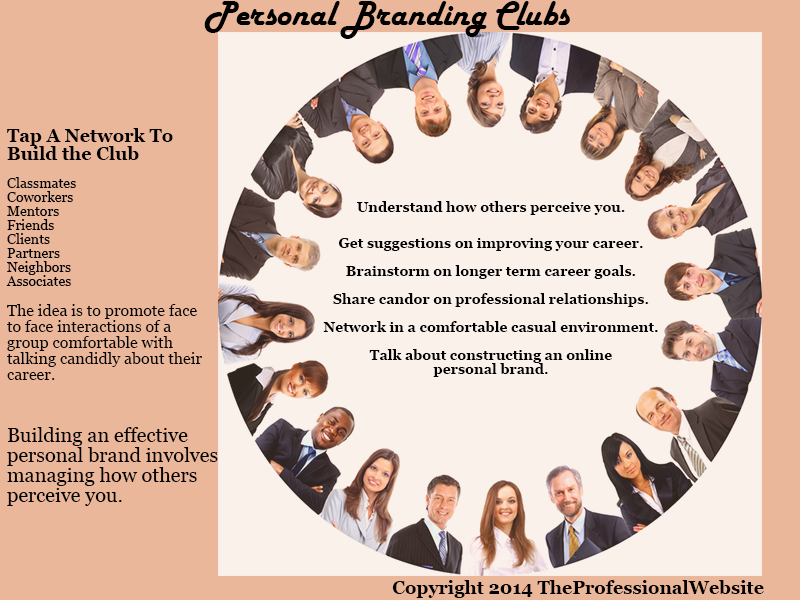 The ‘personal branding club’ has a standard agenda, where there is an orderly way of doing things for each event. The purpose is to brainstorm on how others perceive you, get advice on how to move forward in your career, and simply talk candidly in a non-stress environment about your career. You are the star for the night. Perceptions are often subjective and therefore vary from person to person. It is highly unlikely that every person in your focus group is going to say the same thing about you. And the subtle differences count! Moreover, finding out something you never thought of yourself is precious. I am not sure there is another way to get candid responses. This is why companies use focus groups to understand customer preferences and the effectiveness of their branding efforts. Teenagers understand the sophistication of online perceptions. I watched a PBS Frontline documentary, Generation Like, about teenagers using Facebook. One of the film settings includes seven teenagers sitting around a table at one of their homes; each of them has a laptop and is connected to the Internet. They discuss the impact of each other’s Facebook profiles and answer some of the following questions. What is the implication if I ‘Like’ something? How many views do I get if I post a message or picture? What do you want for your profile to accomplish? What should you have as a profile and cover picture and a caption? Arguably, the stakes are much higher for adults because online perceptions have major career implications. A reputation is paramount because careers are more transient. Professionals are expected to take on more roles and work for different employers. In addition, adults must deal with having all their personal content become professional content (for the most part). For these reasons, I think adults should practice some of the same techniques teenagers are using to understand how they are perceived online. I recommend starting a ‘personal branding club’. [i] Dorrie Clark. Reinventing You. Harvard Business Review Press (Boston, 2013). However, the more I thought about it, the more I realized the importance in understanding how others perceive you. A focus group is the best way to flesh out perceptions. Why not have a series of focus groups and make a club out of it? It is also a generational thing. Before, professionals stayed at a job and did not have a network to promote themselves; it was also not a requirement. Nowadays, most professionals should have an online personal brand – a personal website and presence in social media. So it is worth finding out the effectiveness of a personal brand.